Paige is relieved of her duties as SmackDown General Manager: SmackDown LIVE, Dec. 18, 2018. 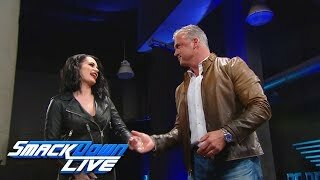 Shane-O-Mac discusses the new era of WWE with all of Team Blue, and thanks Paige for a job well done during her time as SmackDown General Manager. 5 Things WWE Can Do With Paige Since She Got REMOVED AS GENERAL MANAGER!